The clock is ticking for Kansas lawmakers to figure out a school funding solution. Briefs making the case for a plan are due to the state Supreme Court April 15. With only one week of the regular legislative session to go, there’s still significant division over how to satisfy the court that funding is adequate and end the nearly decade-old Gannon lawsuit. The Senate is backing Democratic Gov. Laura Kelly’s plan to add $360 million for schools over four years. Republican leaders in the House think the solution is in targeting more money at struggling students, but they don’t want to promise funding hikes far into the future. The House has not in fact debated a school funding bill. Instead, the chamber approved — by only the narrowest of margins — legislation making a host of changes to school finance policy. House and Senate negotiators will discuss that policy bill next week. The changes would require more reports on test scores and spending by individual districts. Superintendents would have to certify that sufficient resources are being directed to core curriculum and kids who are at risk of falling behind. Republican Rep. Kristey Williams said the policy changes will ensure state dollars are spent wisely. “Accountability is the cornerstone of all good policy,” Williams said when explaining her vote in favor of the policy bill she helped draft. But some provisions of the bill are causing heartburn for school districts. The legislation wouldn’t just require more reporting of school spending. It would also limit state funding for bilingual education for students learning English. The Kansas State Board of Education would be asked to determine each year how money for special education is distributed, tossing out an existing target. The state hasn’t hit that target for special education funding in recent years, but members of the Kansas Association of School Boards don’t want to see it eliminated. “Many districts are disappointed that we just sort of give up on that,” said KASB lobbyist Mark Tallman. The bill includes a mix of policies the KASB opposes and supports, but Tallman said policy issues should not be the focus of lawmakers right now. Plus, the policy bill isn’t likely to get a warm reception from senators eager to move on from years of litigation. The Senate signed off on the governor’s plan more than two weeks ago — a plan that adjusts for inflation funding levels that the court said last year were nearly enough. House Republicans do have a proposal to provide an initial infusion of cash for schools. But it doesn’t include long-term increases many believe the court will want to see. Republican leaders called off debate on the proposal this week for lack of support, but they still believe their caucus can agree on something. There are a few different paths legislators could take to reach a school funding solution next week. If the House approves its own funding bill, that would spark bargaining with the Senate. Or the group of senators and House members slated to negotiate the education policy bill could decide to craft a funding agreement too. Another option, one that House Democrats like, is to simply sign on to the governor’s proposal that passed the Senate with a bipartisan majority. Stephen Koranda is Statehouse reporter for Kansas Public Radio and the Kansas News Service, a collaboration of Kansas Public Radio, KCUR, KMUW and High Plains Public Radio covering health, education and politics. Follow him on Twitter @kprkoranda. Republicans in the Kansas Senate seem ready to end a long-running lawsuit by complying with a court ruling that said the state sends too little money to local school districts. The Kansas House? Not just yet. It’s advancing a plan that would continue adding school spending for another year, and only another year. Gov. Laura Kelly has said she has an easy solution for funding schools: Just renew the finance plan the Kansas Legislature agreed to last year and fold in an adjustment for inflation. But over in the Senate, lawmakers are picking that proposal apart. After months of wrangling last year, lawmakers approved a $500 million multi-year boost for schools in response to a state Supreme Court ruling in the long-running Gannon case. 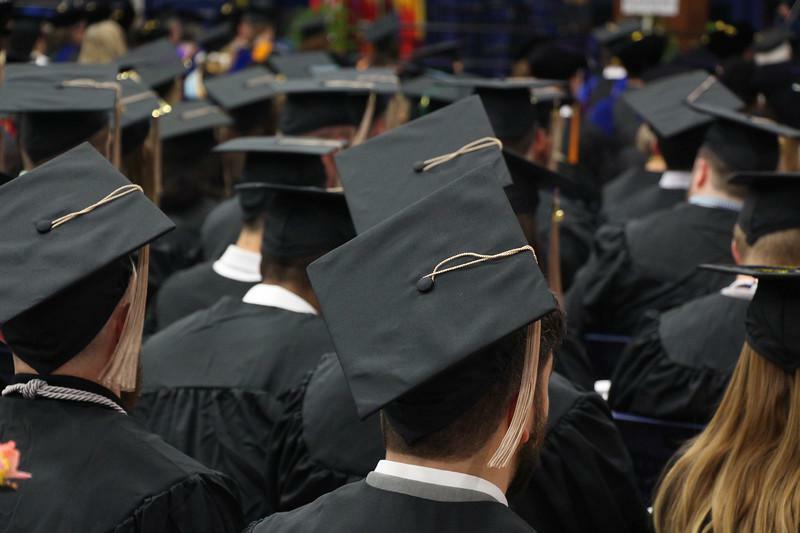 Kansas' high school graduation rate continued to trend upward with the class of 2018 as schools put a growing emphasis on preventing students from dropping out. Of the students who started at both public and private high schools in 2014, 87.5 percent graduated within four years, an increase from the 86.9 percent rate of the previous freshman class, according to newly published state data.